Obituary for Alfred Kenneth Baynton | In Memoriam Funeral Services Inc. Passed away peacefully on Thursday July 19th, 2018 at the age of 93. A proud husband, father, grand father, great grandfather and a great friend to many. His courageous efforts were acknowledged when he was 1 of 7 survivors, being the last one off the ship as he bravely ensured that his shipmates were safe. Discharged in 1945 after the war ended. 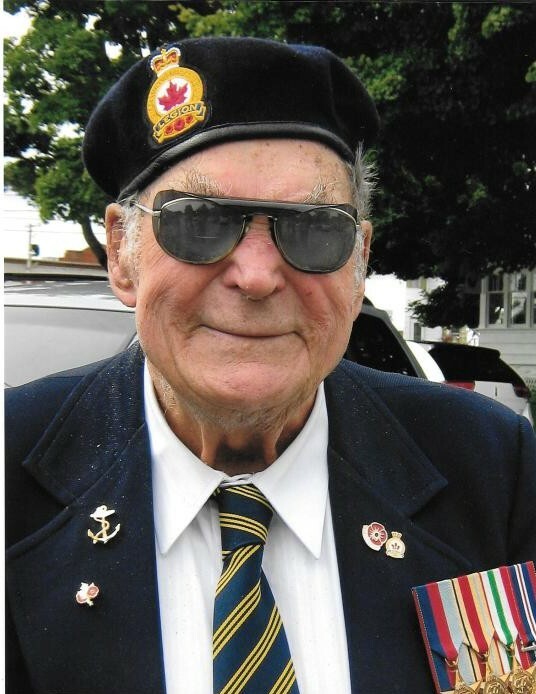 A Celebration of Ken's Life will be held on Saturday July 28th, 2018 at the Royal Canadian Legion, Branch 220, Shelburne, Ontario from 11:00 a.m. to 1:00 p.m. In lieu of flowers, donations may be made to the Shriners Hospitals for Children or the Shelburne Legion, Branch 220. In Memoriam Funeral Services Inc. has been given the honour to serve the Baynton Family.